Female characters in Saint Seiya are few and far in between. Female characters that actually fight are an even bigger rarity. Of the female warriors, very few are a big part of the story; they are usually relegated to being support characters. Mermaid Thetis is one of those characters. She is a warrior of Poseidon and also one of his most loyal subjects. Though the bond between Thetis and Poseidon is not explored in the anime, the Saint Seiya manga reveals why Thetis has such a strong bond with the lord of the sea, or more specifically Julian Solo, the vessel of Poseidon’s soul. At the end of the Poseidon story arc, once the Bronze Saints have returned Poseidon’s soul back to the slumbering state it was in, Julian Solo is returned to his rich-boy self. Returned to normal, Julian sees a beautiful fish, which triggers a memory he had forgotten. As a child, Julian had saved a similar fish that had found its way out of the water. As it turns out this fish was Thetis, who not only became the bearer of the Mermaid Scales, but was also a mermaid herself. Having been saved by Julian, Thetis returns the favor by devoting her life to Julian Solo. The box for this release is a book style box, as it is part of the regual Saint Cloth Myth line.The borders of the box are a green color, designating that she is part of the Poseidon line of figures. The Object Mode of the Mermaid Scales is a mermaid.The armor for the warriors of Poseidon are know as Scales instead of Cloths, which usually refers to the armors of the Saints of Athena. I don’t think I can stress with words just how beautiful this Object Mode is. The metallic pink armor looks amazing on the light metallic purple frame. The Mermaid Scales in Object Mode also tons of shelf presence due it its size and shape. The only thing that really detracts from the splendor of Mermaid Scales is that some of the purple frame is visible on the tail of the figure. Out of the three female warriors that have been released so far, Thetis has by far the best Object Mode, bar none! Shaina and Marin have Cloths that are minimalistic, which resulted in very dinky and unimpressive Object Modes for their armors.This Mermaid Scales, on the other hand, is so great looking that I had trouble convincing myself that I should take it apart to put the armor on Thetis. Alas, the review had to go on. I may pick up a second one in the future, just to display the Object Mode. 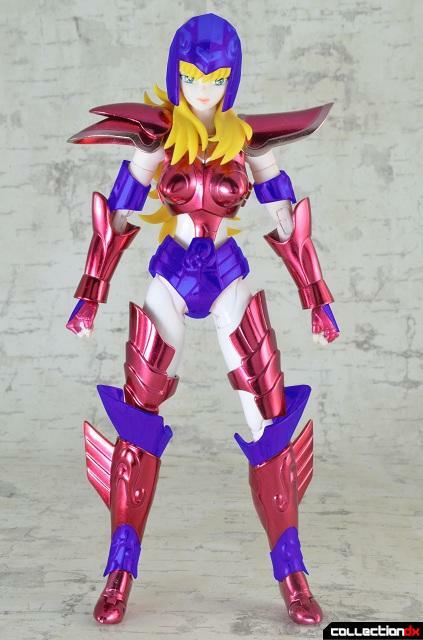 Mermaid Thetis looks pretty damn good in her shiny pink armor. I am a sucker for characters with asymmetric armor, and Thetis scratches that itch with her two distinct shoulder pads, and to a lesser extent with her two armlets that are different sizes. The female Warrior of Poseidon is captured in a gorgeous manner. Her feminine propotions are good, and she has a beautiful face sculpt. She also has more armor than Shaina or Marin: Thetis sports a helmet instead of a tiara and instead of funky 80’s leg warmers, Thetis has ACTUAL leg armor! Her Scales look much more on par with that of the male characters in the series. Although her rank is never revealed in the series, it is assumed that she is on par with the Silver Saints, since she held her own against Ophiuchus Shaina. Since she is of similar power and rank to the Silver Saints, her Scales are more fitting of a character of her power level than Shaina’s or Marin’s Cloths. Kurumuda had originally intended the Cloths (and other variations: Scales, Surplice, etc.) to represent a character's rank. The higher the rank, the more elaborate the armor. As such I felt that Shaina and Marin got the short end of the stick, but not Thetis. I guess gender equality is a little more advanced under the rule of Poseidon. Thetis also looks great without her helmet, with her sweet 80's hairdo; though I cannot remember if she ever actually took it the helmet off in the series. Mermaid Thetis shares the same body type as Shaina and Marin, which is a combination of the 3rdgeneration body of the male Saints and the body used for the previous female characters (Athena, Pandora and Hilda). As such she has quite a bit of articulation, although she is restricted some by her armor, unlike Shaina or Marin whole lighter armor restricts them less. The feet of Thetis cannot move much do to the leg armor and her abs can cruch much less due to the amor that is over them. While there has to be some trade-off between armor and articulation of this figure, I felt that it strikes a good balance. She can take a knee, even without the hinge on the tip of her foot moving much. She can sit... kind of. Her thigh armor and crotch armor restict her ability to sit as freely Shaina and Marin. Mermaid Thetis is also able to pose well and pull off her one signature move, the Death Trap Coral. As well as her generic energy punch move. 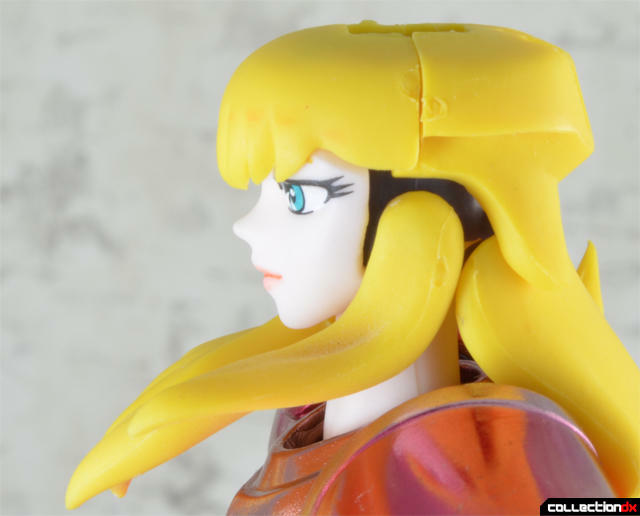 One revolutionary bit of engineering that was incorporated in the toy, which has not been used before in any figure in the Saint Cloth Myth line, is the use of separate hair pieces that drape over the front of the character. Each of these hair pieces attached to its own socket on the side of the head. This allows these pieces to move independently of each other and the main front hair piece. Traditionally, these pieces of hair have been part of the sculpt for the frong half of the character’s hair. This has resulted in the movement of the head being restricted because the draping hair bumps into the shoulder armor. With the EX Scorpio, Bandai sought to fix this problem by giving the Milo less hair over the armor. This made the character look less like he does in the anime, however, in which Milo has long voluminous hair. This problem of sacrificing form over function, and vice versa, has been remedied for this release as you get best of both: screen accurate hair and freedom for the head to move. Let's talk abou tthe extras. I love it when Bandai includes more than one face with a character in the regular Saint Cloth Myth line. After the experiencing expressive nature of the EX line’s faces, it is hard to go back to only having a single neutral face. Bandai included two faces for this release. Unfortunately, this is a missed opportunity as one is a neutral face and the other face is a neutral face with Thetis looking to the side. The both appear to be the same face scuplt, only the eyes are imprinted differently on each face. Thetis does not come with a mask, unlike the other Female warrior so far. Unlike the female Saints of Athena, Thetis does not have to wear a mask to hide her femininity because she does not abide by the rules of Sanctuary. Again, I think Poseidon must be a much more liberal ruler. Besides the faces, Thetis comes with three sets of armored hands and two sets of unarmored hands. It was a nice touch having the extra unarmored hands for Thetis, as Bandai usually just includes the clenched fists for the unarmored character. The metal to plastic ratio for armor of this figure is about 70/30. The top and bottom pieces of the leg armor. While there is a substantial amount of diecast content, it felt like Bandai could have included a little bit more metal in the armor. Now this is one of those Saint Cloth Myth Figures that you are going to want to find a pose that you like to put the figure and leave it on the shelf to admire the beauty of the character. Why, you may ask? Well, the armor on the lower half of the figure requires quite a bit of patience for several reasons. First off, as mentioned earlier, the leg armor is composed of three parts: the main center piece, a small piece at the bottom, and the larger flared piece at the top. The leg armor was made into three pieces because they each fit onto different parts of the Object Mode. Which works great for that, but when the armor is on the figure, the top piece has a tendency of not staying in place, while the bottom piece sometimes does not align properly. At best this results in gaps between the pieces, at worst the top pieces ends up popping off and spinning around Thetis’ thighs. To complicate this issue, the thigh armor sometimes slides down to the knee, toward the flared piece of the leg armor, either popping the flared piece of the leg armor on or just resting on it. Even if the thigh armor merely rests on the flared piece of the leg armor, this can often result in the flared piece of the leg armor being knocked off in the process of trying to restore the thigh armor to its rightful place. Another part of this character that makes posing more challenging is the fact that she has small feet. Combined with the fact she has a raised heels on her foot armor and she is not as easy to keep upright as the male characters in the series. This is probably as close to ever knowing what women mean when they say it is hard to walk in high heels as I will get. Since most of the issues that I had with this character are from the waist down, it seems like Bandai could have paid more attention lower half of this mermaid. Nontheless, this is a decent release and a must have for completionists out there. We finally have all of the characters from the Poseidon Arc in the Saint Cloth Myth line, and that in and of itself is reason enough for fans of the Saint Cloth Myth line to rejoice. OMG she looks beatiful! maan I never really care for her in the anime but this looks awesome! wonder if she is releated to Misty :P cause they could be twins! Also yup she completes the Poseidon line but also prolly one of the last regular myths releases in general or how many more you think are left? 4-5? Dari- Oh- Huh. I had never really thought about the similarities between Misty and Thetis. They do share a resemblance. The regular SCM line cannot have many characters left. I mean there is Athena, Chameloeon Jun and a handful of specters.Other than that Bandai could make the Saints from the movies, which woud probably be web exclusives, to artificially extend the line. Then again, the rumor is that Toei is going to be animated Next Dimension after they are done with the CG Saint Seiya movie. So if the Next Dimension anime catches on with the fans of the original, which Lost Canvas and Omega failed to do, it could open up a door for a whole new set of characters in the SCM line. Bandai can then do the few new characters in the story, along with the Gold Saints of that era. I guess since the Poseidon and the Silver Saints arcs are so far apart, I never really made the connection. I would not mind having the Touma ( and maybe the other Angels). What does Touma's Cloth look like in ND? I stopped reading when I couldn't find any more scanlations. Thanks for the pic of Tatsumi. I was not aware that he was being made by a third party Chinese company. How could would it have been if they released in a Myth Cloth style box , with his kendo gear. I have been tempted to pick up some of these third party Saint Seiya figures, like the Shunrei, which has popped up on ebay a couple of times as Chunli. However, I have sneaking suspicion that when I open the package, I am going to be disappointed by the low quality of the toy.